Affordable Wholesale Golf Towels For Sale | Towel Super Center 404 The requested product does not exist. Golfers would never dream of teeing off without a few essentials: clubs, tees, balls — and a towel. If you golf a lot, you know those towels get dirty fast. Golfers like their clubs to be pristine. They frequently use golf towels to wipe down their clubs when they become wet or grimy out on the course. If you manage a golf course, you know how important it is to have clean, durable towels on hand for guests to use. Towel Super Center works hard to provide our customers with the lowest possible bulk order pricing on the golf towels they need. All our golf towels are 100 percent cotton, ensuring maximum absorbency and a soft feel. A good golfer knows how to focus and appreciate details, and a great towel is a detail that makes a difference. What Are the Benefits of Wholesale Golf Towels? Pool players wouldn’t strike a ball without chalking up their pool cue first. The same idea applies in golf, except golfers use towels instead of chalk to prepare their equipment for the next shot. Many golfers wouldn't even play a round without a golf towel to wipe down their clubs. Why? A dirty club or golf ball can affect performance in a big way. The dimples in a golf ball cause the ball to travel about twice as far as a smooth ball could go. If the ball got coated in mud, for example, it is likely to affect how far the ball will go. Clean equipment, therefore, is essential. So why buy wholesale? Well, if you play a lot, you probably use a lot of towels, and it only makes sense to buy golf towels in bulk. You may also need towels for reasons other than cleaning golfing equipment. 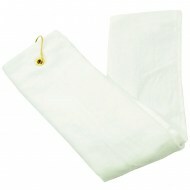 For example, on a hot day, a soft towel can help keep your neck cool and protect you from the sun. You can use a golf towel to wipe sweat out of your eyes or dry your hands for a better grip. You’ll never know when you might need a towel on the course, and you don’t want to use dirty towels for different purposes. 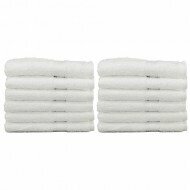 Stock up on lots of towels beforehand so you won’t have to leave the course in search of a clean towel. Buying wholesale will save you time, money and ultimately make the game more pleasurable. If you manage a golf course, you probably don't want to put guests in a position where they need to leave to get clean towels. You want to have plenty of quality towels available always. 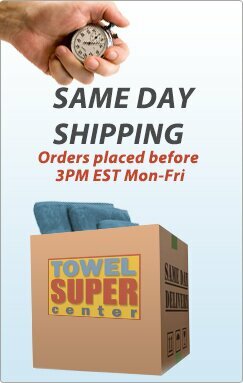 Because you need a lot of towels, buying wholesale is your best option. In general, here are some reasons to buy wholesale golf towels. You want to save money: Buying wholesale is less expensive than buying one towel. If you buy quality towels and take good care of them, you'll be set for a long time. With our golf towels, you can expect high-quality and powerful absorbency with each towel. You want your own towels: You want a lot of towels on hand, or at least three or four clean towels on a good day. You don't want to have to share used towels with someone else, because that’s unsanitary. Another plus to having lots of towels? You can loan a clean towel to your golf buddies and take the lead in kindness. 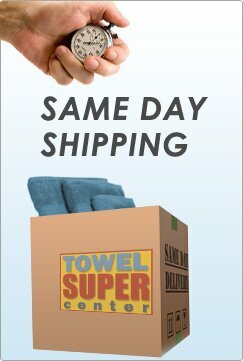 You want more time: Buying wholesale is a convenient way to stock up on towels in one easy step. You won’t have time to run and buy or wash towels while you’re on the course, and you don’t want to worry about towel shopping before you leave for a game either. You want a clean, unified look: If you buy wholesale, you can order towels that all look and feel the same. 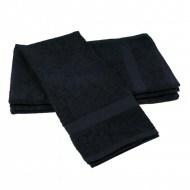 Quality matching towels will lift your spirit and in turn, boost your performance and confidence. Just be careful — your opponent might envy your pristine style and try to swipe a towel when you’re not looking. You need to focus: Golfing requires intense focus. How can you pay attention if you’re worried about where to find a clean towel? Stocking up on wholesale towels helps take unnecessary stress out of the game, and gives you more freedom to get in the zone. You manage a business: If you own a golf course, you need tons of golf towels to keep guests happy. 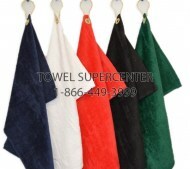 You can get towels all in the same color to complement your company logo. White towels are a great choice, too, because they make guests feel like they are at a spa. Who can complain about that? It makes sense to have a lot of clean, quality towels handy when you’re on the course, and that's why we feel good about our wholesale golf towels. Save yourself time, money and trouble, and put your energy and mind into your game instead. 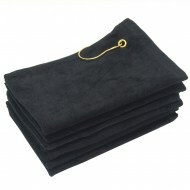 Why Choose Terry Velour Golf Towels? In the 16th century, golf gained popularity due to royal endorsement in England and France. You don't want to be on the green with scraps from an old beach towel hanging from your golf bag, right? Well, we won’t judge you if that’s your choice, but we’d like to suggest something that might boost your confidence a little more. After all, confidence is a necessary ingredient in sports. If you’re concerned about royal prices for a nice golf towel, you can rest assured. Our golf towels are both affordable and high-quality. And you can’t beat that, no matter how good your swing is. You’ll also save money because our towels are durable, and you won’t need to replace them after a couple of uses. Lower-quality towels will have you running to the store in no time. You want a towel that does the job right. Our terry velour golf towels are designed to meet your needs on the course. Are you wondering what terry velour is? First, let's consider terrycloth. The word terry comes from the French word tirer, which means “to pull.” Originally, terry towels were made by pulling the loops out by hand. Terrycloth is made of uncut loops and usually cotton or a blend of cotton. 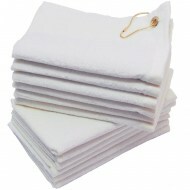 Our towels are 100 percent cotton, meaning they are highly absorbent. Terrycloth is the perfect material for soaking up moisture. The loops act like tiny sponges, and they help the towel dry faster. When it comes to choosing a golf towel, you want a towel that’s absorbent. Otherwise, you’ll be running out of towels quickly. Velour is a French word that means velvet. Velour is made using the same process as velvet, but consists of cotton instead of silk or synthetic fabrics. Like velvet, velour has a soft, luxurious feel. You’ll feel like you’re polishing a gem when you wipe down your golf club or golf ball with velour. And there’s no better way to treat your equipment than to treat it kindly. Which fabric should you choose for a golf towel? With our terry velour towels, you don't have to choose — you get the best of both worlds. The terry side of the towel is perfect for absorbing moisture, while the velour side can clean grooves and gently shine golf clubs without scratching. Plus, they look and feel magnificent. 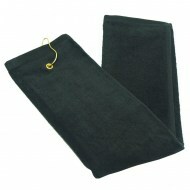 Guests will feel like they are receiving special treatment with our terry velour golf towels. They’ll never know the money you saved by buying in bulk! 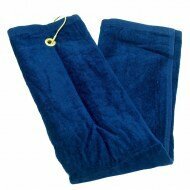 In short, terry velour golf towels are fit for a king or queen, minus the royal price tag. Why Is It Important to Use a Golf Towel With a Grommet? The grommet, also known as an eyelet or the metal ring inside the towel, protects the towel fabric while providing a hole for a hook. You want a golf towel that has a grommet, so you can hook the towel to a golf bag or other surface. Most golf bags have a place to hook a towel. During a round, you don't want to waste time digging for a clean towel to dry your hands, wipe sweat out of your eyes or rub dirt from your golf club. A grommet provides ease of access, saving you time and trouble so you can focus on the game. Plus, you don't want to keep others waiting. Versatile — You don’t need to just hook them to your golf bag. They can hang wherever there’s a place for them. Durable — The grommet prevents fraying and tearing, so you can hang the towel while maintaining its qualities. Convenient — The point of having a golf towel is to be able to use it quickly when needed. 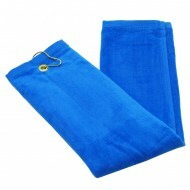 As a golfer or golf course owner, you want towels that are easily accessible. You’ll play a better game, or you'll make guests feel appreciated. Never use high heat when drying terry velour towels. Too much heat can damage their fibers. Shake towels out before drying them to help fluff the terry loops. Tumble-dry or air-dry towels. If you air-dry towels, hang the towels flat so they can breathe, which will prevent mildew. Use a mild detergent to avoid stiffening towels. Don't use fabric softener too often, because it can cause a waxy buildup. 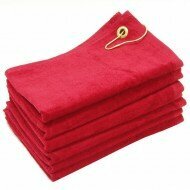 Use warm or cold water to wash terry velour towels. Hot water may cause fading or loss of softness. Run towels through the wash twice with half a cup of baking soda to help reduce odors. Don’t iron the towels, as this could lessen absorbency. As with any towels, always check the label for care instructions. Wash towels after every use. Keep towels separate from other clothing. Terry velour towels may produce lint which could get onto other clothing. To set colors, use half the amount of detergent you would use for a regular load, and add half a cup of white vinegar to the water. The vinegar will also help remove detergent residue, act as a stain remover and soften the fabric. Wash in warm or cold water. If bleaching, use warm water and color-safe bleach for colored towels or hot water and bleach for white towels. 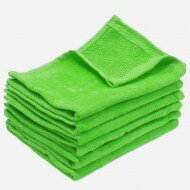 If you take care of your terry velour towels, they can last a decade. It’s worth buying quality towels because a good towel will last for years. Our wholesale golf towels offer everything you need. 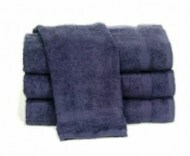 Our towels are not only durable, absorbent and soft, but they are affordable, too. Golfers love our towels for their fluffy, luxurious feel and their high absorbency. Our terry velour golf towels are available in classy colors from royal blue to ruby red. The more towels you buy, the more you’ll save. You’ll also save on shipping costs because we tightly pack our towels. When it comes to finding wholesale golf towels online at bulk prices, you’ll save hundreds off retail prices when you shop at Towel Super Center. Still not convinced? 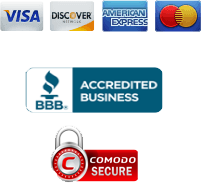 Check out our convenient shipping and return policies, or contact our attentive customer service staff for more information. From golf courses and country clubs to schools, medical offices and savvy consumers, Towel Super Center is ready to help you save more than you ever thought possible. Explore our online catalog and see why we’re the home for wholesale linens on the web!